Interior decorators! Design enthusiasts! Folks who just love to put pretty things together in a room! 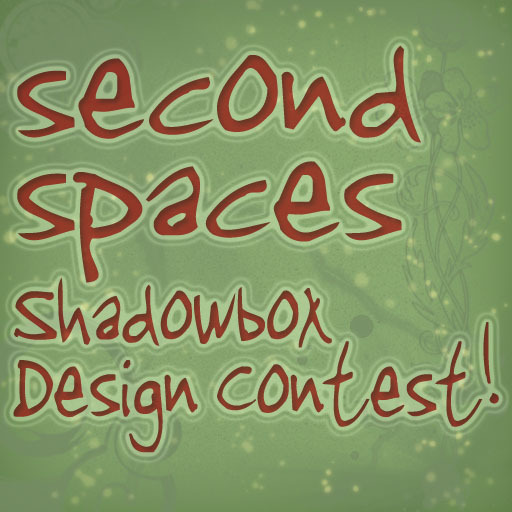 Second Spaces is delighted to announce our first ever Shadowbox Design Contest!! Here’s how it works: each contestant gets a Second Spaces shadowbox to decorate. “Exotic Getaway” can mean a lot of things — especially in Second Life! We have an expert panel of designer judges who will select our winners – we’ll be looking for creativity, clever aesthetics, smart use of prims, and an overall sense of design. Make your shadowbox a place where the judges will want to vacation! 😉 The contest will run for approximately 2 weeks, during which the contestants can organize their shadowboxes. We’ll wrap it up with an event on August 9th when the boxes are ready for viewing — we’ll have a live DJ and festivities, the judges will make their selections and we’ll announce the winners at the end of the event! It’ll be a party, so everyone is invited! You’ll see a rent box in front of the shadowbox; right click and pay $1L to rent the space. Right-click and Buy the shadowbox for $0L. Do NOT Take the shadowbox into your inventory; when you buy it, you’re buying the original, so leave it sitting right where it is. Buying it will allow you to retexture the inside of the box as needed. Send an IM to Elle Kirshner to let her know you’ve entered the contest! – Only 200 prims are allowed in your design! That includes furniture, accessories, plants — whatever you use. 200 prims is all you get! – No more than $1000L can be spent on your design! That’s right — it’s exotic on a budget. 🙂 On the day of the contest event, you’ll be asked to provide a notecard detailing all objects purchased and their Linden value. – Your design elements can be purchased OR built by you! Now’s your chance to show off your building skills! – Only the INSIDE of the shadowbox can be re-textured. The outside must remain textured with the Second Spaces background. – You may place items just outside the shadowbox on the platform, if needed. That’s it!! Prize categories and prize packages will be announced soon. 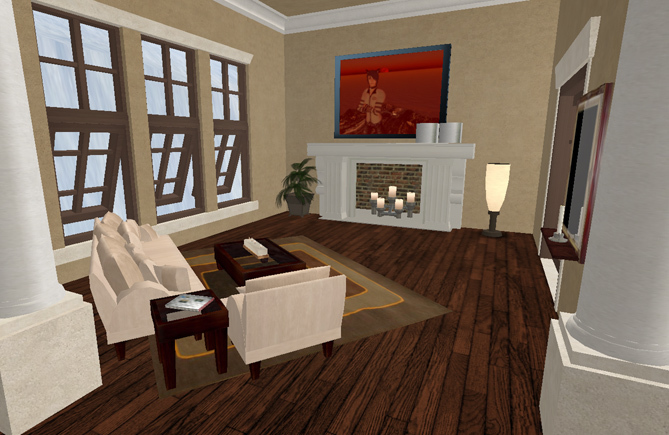 Here’s what I can tell you now: the prizes are provided by some of the best furniture/decor designers in all of Second Life! Don’t miss your chance — get over to the Second Spaces contest grounds and claim your shadowbox, then get to it! Keep your eye on the blog for more info on the prizes and the progress of the contest! Good luck!! 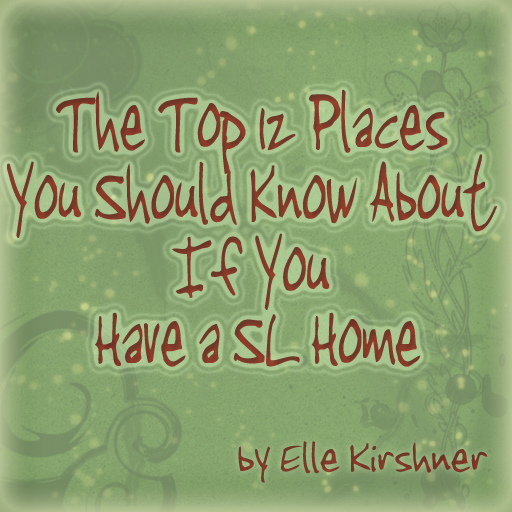 Here’s sort of a quick link guide to the Top 12 places. I hope it’s been useful — I really, truly appreciate the great comments received here and in-world, and it’s been absolutely delightful to speak with several of the designers that were spotlighted in the list. I’m going to add a link over to the right of the page so that this post can be easily accessed going forward, and I really do hope it can be considered a toolkit of sorts for folks who are ready to claim their own second space! Thanks again to all for the positive feedback on this series. Stay tuned — I’ve got more evil plots that I’m hatching and plan to unleash on the world – you don’t wanna miss that! In the meantime, I’m going to try my best to resume regularly blogging; I have a few places I was contacted to review, so I want to be sure to get those taken care of first. Hope you’ll check back often! *Second Spaces* Top 12, part 5! Welcome to Part 5 of my Top 12! Need some background on what this list is all about? Click here for the original post. 1) Her stuff is awesome. 2) There’s a ton of it. Really. 3) Xandi is all about the details, and I ❤ that about Del Sol. Bohemian Classic Living Room: I love the curvy shapes on the wooden chairs and sofa. 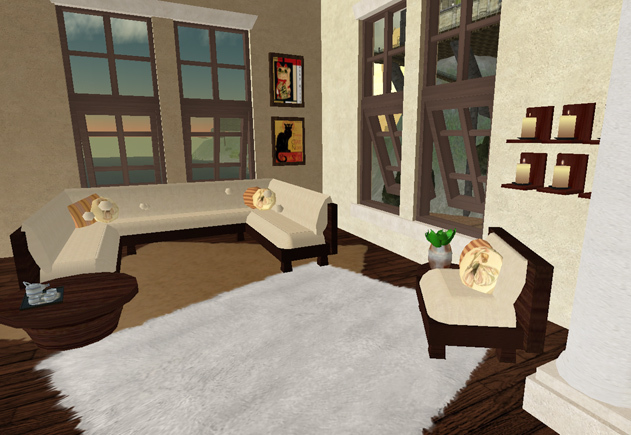 Also, you’ll see in this pic how Xandi gives you a rug, some art options, a lamp — this is common in her displays, and really does help when you’re trying to decorate a space. 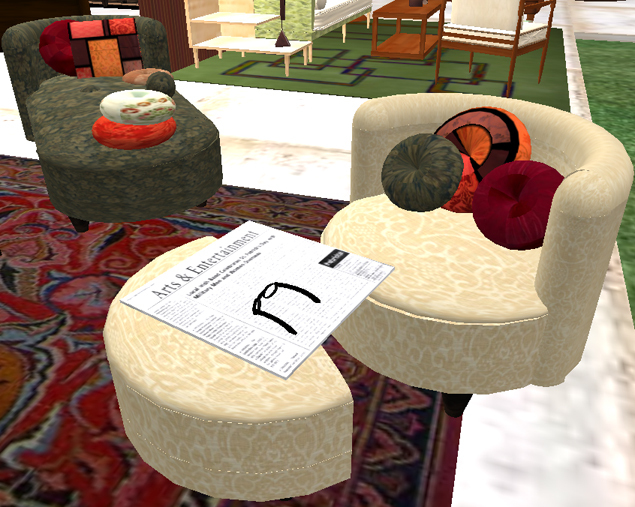 Last picture – because it’s so cute — here’s the attention to detail that I love: a newspaper with reading glasses. Perfect! Swing by Del Sol and wander around for a while. I guarantee you’ll find at least 7 things that make you go ‘ooh’! We’ll start with the entry. The bookshelf is from the Loft3 — one of my favorites, of course. The planter in the corner was made by me, and I filled it with some gorgeous lillies from Heart Garden Centre — another one of my favorites. The Rocky poster was Ulrich’s, and the one item that he insisted remain in the house. No objections from me – I love Rocky! – so I made it a focal point. The Alabama posters are more creations of mine — Ulrich is an Alabama boy. 🙂 The rug is from Del Sol, an awesome shopping experience, and one that I should highlight soon. As you come through the front door and turn to your left, you see the awesome spiral staircase, and we set up a basic entrance. If Ulrich received SL mail, I imagine he’d place it on this table. 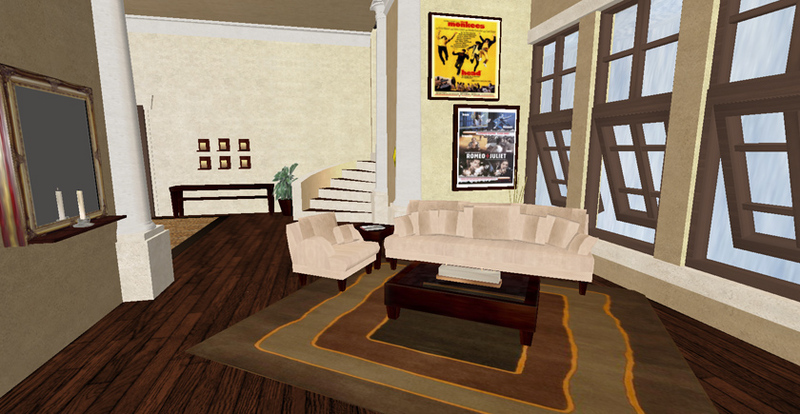 We kept the living room simple with a basic, tailored set from Ramos Designs. Ulrich had previously procured the candles and placed them in the fireplace, for which he received 10 decorating points. 🙂 The rug is from Van’s Home & Garden, and the mirror is from The Old Curiosity Shop. The Monkees poster is another surprise creation/gift from me to Ulrich. We both ❤ the Monkees. At the top of the stairs, we have a small seating area. The chaise is another piece from the Ramos Designs living room set, and the dresser goes with the bedroom set, which is also from The Loft3. Both pieces of wall art are from The Loft3, as well. The rug is from Del Sol. Finally, we have what Ulrich deemed the Love Nook. I’m not sure if capitalization is appropriate, but I’ll give him the benefit of the doubt. 🙂 The seating is from Neva Naughty (heh heh), the white rug and the candles are from Ramos Designs. 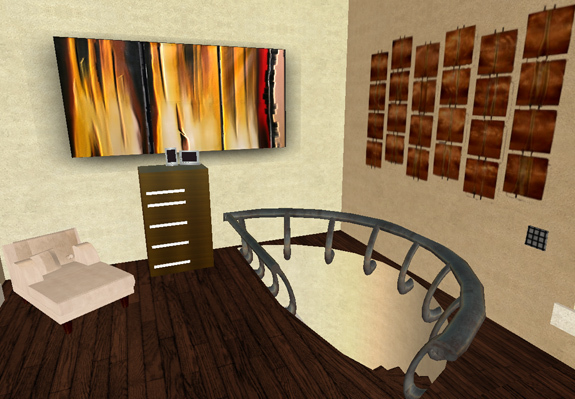 The pictures in the corner are more creations of mine, just for Ulrich’s house.